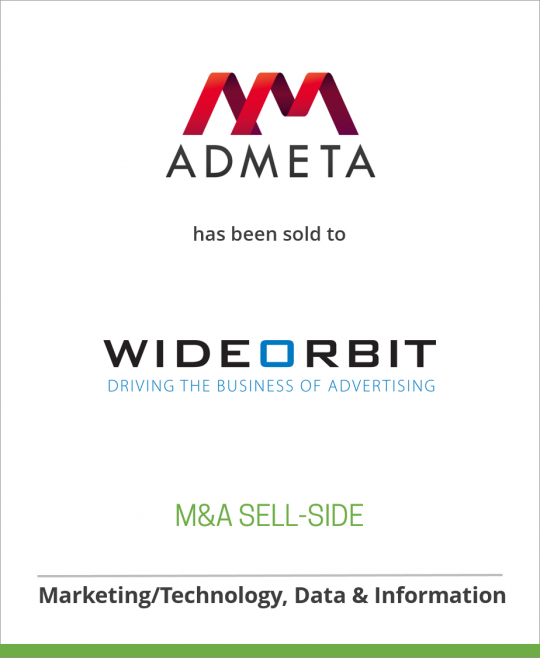 DeSilva+Phillips client, Admeta, a leading provider of solutions for digital programmatic sell-side platforms based in Sweden, has been sold to WideOrbit Inc., the leading provider of advertising management software for media companies. This acquisition is part of WideOrbit’s ongoing commitment to expand its digital offering for major media companies and provide the most comprehensive media management solutions globally for premium publishers. Founded in 2002, Admeta provides sophisticated yield optimization solutions that help premium publishers significantly improve digital revenue. Admeta’s core functionality includes Artificial Intelligence-based learning, dynamic floor pricing, full premium programmatic support for private marketplaces and Deal ID. WideOrbit intends to leverage Admeta’s advanced optimization technology across programmatic solutions for both broadcast and digital. Headquartered in Gothenburg, Sweden, with sales representation in New York, Ottawa, Helsinki, Tel Aviv and Prague, Admeta currently works with more than 30 premium publishers in over 20 European countries, including Alma Media, Prisa Digital, Grupa Onet, Agora and MKT Media. Admeta manages over 20 billion impressions per month and is the fourth largest sell-side platform by market share, according to LeadLedger. Admeta is the third company that WideOrbit has acquired recently as part of a strategic initiative to expand its digital offering. April 30th, WideOrbit acquired Fivia, a company based in Paris, France that provides a digital sales and operations platform for premium media. June 9th, WideOrbit acquired Abacast, a leading provider of streaming, live and on demand ad insertion and monetization solutions for digital audio headquartered in Vancouver, Washington. With Admeta and Fivia, WideOrbit now can deliver a comprehensive solution that offers both premium direct sold and programmatic yield optimization to premium publishers. WideOrbit is the leader in premium broadcast technology and the largest sell-side processer of premium advertising in the world, covering the most media platforms. WideOrbit software currently manages more than $30 Billion dollars in annual ad spending. WideOrbit is committed to helping media companies manage their advertising business more efficiently and profitably, from proposal to receipt of cash, across all media platforms via any sales method, from direct sold to programmatic. Headquartered in San Francisco, California with offices across the U.S. and Europe, WideOrbit has been profitable for more than 15 straight quarters and has more than 450 employees globally. Admeta will operate as a fully owned subsidiary of WideOrbit. Financial terms of the acquisition have not been disclosed. WideOrbit (www.wideorbit.com) is the leading provider of advertising management software for Media companies. WideOrbit provides innovative, proven solutions for managing the business of broadcast and cable operations – from proposal to order, scheduling to automation, billing and aging. WideOrbit has been helping clients since 1999, delivering high ROI, greater efficiencies and revenue optimization. More than 2,700 Television stations, Radio stations and Media Networks around the globe use WideOrbit Traffic software and another 3,200+ stations operate on WideOrbit Radio Automation platforms. WideOrbit software manages more than $30 billion in advertising revenue annually. Clients include: Bell Media, Corus Entertainment, DirecTV, Entercom Communications, Fox Sports, Galavision, Gannett Co., Hearst Television, Madison Square Garden, Meredith Corporation, Midwest Communications, NBCUniversal, NHL Networks, Rogers Communications, Scripps Television Group, Tribune, Yankee Entertainment Sports, Univision, Viacom and more than 300 other major media organizations. WideOrbit is headquartered in San Francisco, with offices in Seattle; Denver; Dallas; Vancouver, WA; Birmingham, AL; Agawam, MA; Paris, France; and Gothenburg, Sweden.